“The manager asked me questions about what I would do in certain work situations,” she remembers. 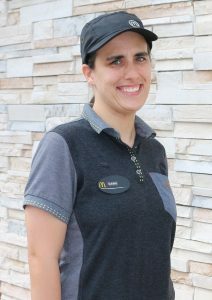 Her experience working at another McDonald’s location in High Point, before moving to Whiteville, provided her with knowledge and experience to correctly answer the questions. Fowler moved to Whiteville in 2017 and was excited about the prospect of securing a job and attending the Columbus Industries day program. She began her role at McDonald’s with a job coach, but managers quickly realized one wasn’t needed. “Dawn takes care of what she needs to do,” says Hancock. “This job makes me happy and gets me out of the house,” she says of her three-day-a-week role. “I get along with all of the customers and the staff. I like meeting people,” shares Fowler. Photo caption: Columbus Industries’ Dawn Fowler shows off her signature smile during a recent shift at McDonald’s.